Business People TV – Is facebook on the decline? So… what happened there? On Friday, after an all-night hackathon at Facebook’s Menlo Park campus, Mark Zuckerberg pressed a button to mark the start of trading in his company’s shares. Because that button had been “hacked” by some of his very smart engineers, his Facebook status was updated to “listed a company on Nasdaq”. Then after a hiatus as Nasdaq’s systems struggled to cope – perhaps they need to hire some of those smart engineers – the share price began to soar from its already vertiginous $38 to $42. Then it began to sag, and by the time trading ended, it was just a fraction above the starting price, apparently only kept there by the efforts of the underwriters. Predictions of a first day “pop” had been confounded. The expectation had been that small investors, intoxicated by the excitement surrounding the IPO, would rush to get in on the action, sending the value of Facebook to even more giddy heights. Now there’s a message that tends to get obscured in bubble times – putting money into a company should involve a deep understanding of what it does now and where it is heading. And if you’re investing in a business at a price roughly 100 times its current earnings, all the more reason to be confident that it has a plan which will multiply those earnings many times over. And one more reason why small investors should be cautious. On Saturday, Mark Zuckerberg updated his status to “married”, as he wed Priscilla Chan in a surprise ceremony at his Palo Alto home. Nothing wrong with that – the couple have been together since their student days, and the pictures posted on Facebook of the shy groom – in a suit not a hoodie – and his bride were rather sweet. But, hey Mark, why did you not do what you tell the rest of us to do, and share your plans with your Facebook friends a few months ago? If you’d made it an upcoming “event”, then you and your fiancee would have seen plenty of useful adverts from cakemakers, dress designers, florists and all the other wedding businesses which now find the social network a great place to market their services. Of course he wasn’t going to do that – even if the “event” had only been visible to close Facebook friends, it would have been bound to leak out. But Mr Zuckerberg’s whole philosophy – and the future revenues of his business – revolves around the idea of the “frictionless sharing” of every detail of our lives. And if more of us decide, like him, that there is a downside to letting it all hang out, then the advertising cash may grow more slowly than the $104bn valuation implies. For other technology firms hoping to follow Facebook on the road to IPO riches, any sign that the bubble may burst is deeply worrying. Last week, the day before the IPO, a package was delivered to my office. It was a pinboard – yes, an old-fashioned cork board on which you stick notes. Pinned to it was a press release announcing that Japan’s Rakuten had led a $100m investment round in Pinterest, the virtual pinboard social network. Pinterest is now valued at $1.5bn, though there is not much data around about its revenues. 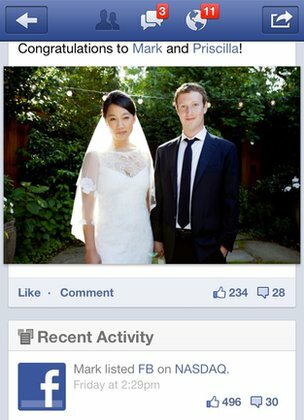 So, an imaginative PR stunt – but perhaps more evidence of the investment bubble that Facebook has helped inflate. Now Pinterest, Spotify and other hot technology firms enjoying sky-high valuations will watch anxiously to see what happens to Facebook shares in the coming days. For Mark Zuckerberg and his colleagues, there’s not too much to worry about in the short-term – they’ve raised $16bn, whatever happens to the share price now. But perhaps we’ll look back on May 2012 as the month when the air started to leak from a technology bubble.